Hunting with Godfrey Bloom; lunching on expenses with Janice Atkinson; talking ‘shock and awful’ campaign tactics with Douglas Carswell – nothing is off the table when you’re on the trail of UKlP’s People’s Army. Fear and Loathing on the Campaign Trail ’72 meets Louis Theroux, Following Farage recounts one hack’s journey as he follows, drinks with, laughs at and even occasionally defends the phenomenon that is the United Kingdom lndependence Party as it prepares to march upon Westminster. 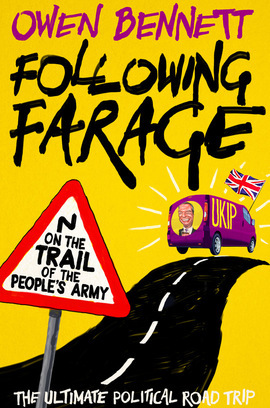 With exclusive interviews and unfettered access to all the disgraced generals, trusty foot soldiers, deserters and dissenters who make up its ranks, Bennett delivers the inside scoop on what makes the People’s Army tick – all the while making the transition from elbowed-out hanger-on to the journalist Farage calls for an honest, post-election run-down of events. From the initial skirmishes and battle plans (the successful and the scuppered) to the explosive events of the battle for No. 10 itself – and the all-out civil war that broke out in its aftermath – Following Farage leaves no stone unturned, avenue untrod or pint undrunk in its quest for the truth about Britain’s newest and most controversial political force. An eyewitness, behind-the-scenes account of exactly how the wheels can fall off any bandwagon. Ukippers ought to read it, but they won’t dare. Everyone else will wet their pants.